As a team, we begin by staying true to our values and purpose so we can serve others at our full capacity. In teaching clients to practice the same level of self-nourishment, we propagate a continuous cycle of nurturing and growth, which leads to profound transformation in an organisation. Intuitive intelligence encompasses all other intelligences—intellectual, physical, emotional, social and spiritual. We value this Intuition in ourselves and show clients how to feel the connection between body and mind for greater understanding and more impactful interactions with the world. Adaptability is the door to profound transformation for us, those whom we serve, and the greater world. Adaptability is a continuous attempt to refine and improve our craft through exploration, experimentation, and a willingness to let go of fixed beliefs and roles. Our curiosity and constant drive to learn more about ourselves, others, and the world leads to growth and innovation for us and those whom we serve. The overriding law governing everything in one’s life is interconnectedness. From the individual to small personal and professional groups to large communities and organisations, these systems reciprocally impact each other on a constant basis. Embracing the law of interconnectedness holds the key to aligning our inner world (mind, body, and heart) as well as understanding our influence and impact on the outer world. In gratitude for our journey of passion, constant learning and self-realisation, we share our resources with abundance. This includes our commitment to being a channel of knowledge to organisations and individuals in both professional and pro bono situations. The pillars of authentic interaction are being true, genuine, and transparent. Within ourselves, our teams, and with our clients, we operate with authenticity. To cultivate new skills or develop old ones requires presence of mind with ourselves and our surroundings. We strive to be mindful of what is happening without being affected by assumptions so we can create a strong foundation for each and every skill. We are governed by our curiosity and drive to acquire knowledge about ourselves, those around us, and the greater world, which puts us on a path of constant growth, creativity and innovation. KUN ( كن ) refers to the ancient Arabic word describing the act of manifesting, existing, and being. This powerful word perfectly describes our goal of profound transformation through experiential coaching. KUN also illustrates our dedication to helping individuals rediscover, cultivate and strengthen who they want to be. Your happiness, health, success and prosperity are states of being that require clear purpose, passion and ongoing practice. 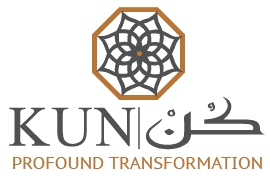 KUN is our promise to provide transformational experiences that are specially designed to promote clear purpose, passion and a constant desire to thrive.